A few months ago, I had the pleasure of being interviewed by Karina Dunn, from Made in Kansas City, for their new Made in KC Explore website. It’s a site to explore all things Kansas City lifestyle, food, and events. Interviews tend to make me feel awkward, so I don’t usually agree to them; however, Karina created a great conversational list of questions that made it the most fun interview I’ve ever had (you can read it here if you’re interested in knowing me a little better). 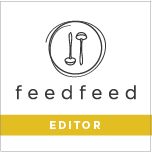 When Anna Petrow, their editor and food & lifestyle photographer extraordinaire, asked me to share a follow-up recipe with them I was happy to accept. Plus, I’d been craving Salted Caramel Brownies lately, so this was the perfect excuse to create them and call it “work.” These brownies are made with a quality dark chocolate that’s been melted with butter and blended with sugar, eggs, vanilla, salt, and flour. Right before baking, the batter is topped with generous swirls of silky salted caramel. The final baked brownies are fudgy and have a balanced depth of flavor that is subtly salty and not too sweet. If you’ve never tried the salty-sweet combination before these brownies are a great place to start. I’m sharing the recipe on Now, Forager today, but you can also find it on Made in KC Explore and read up on all the interesting events happening in the city. *In this recipe, you’ll be making your own salted caramel sauce. This may seem intimidating, but making caramel is actually very simple. One does have to work carefully though, when working with hot sugar syrup, so be sure to read through the recipe before starting and measure out all the caramel ingredients beforehand. That way you’re ready to go, with no interruptions, and the process can go smoothly. The caramel can even be made a day, or up to a few days, beforehand if desired and stored in an airtight container until ready to use. *When swirling together the salted caramel and brownie batter, don’t be afraid to dig in there and create big swirls that create crevices in the batter. This will give the caramel a place to seep into and produce a beautiful texture to the final baked brownies. *Use the best dark chocolate you can get your hands on. Brownies are uncomplicated and simple, yet using really good chocolate can make them taste extraordinary. A quality chocolate has depth of flavor and it’ll impart those notes into the brownies. Combine the sugar and water in a medium-sized pot. Over medium-high heat, and without stirring, cook the sugar until it begins to caramelize and reaches a deep amber color (the caramelization process goes quickly, so no walking away from the cooking sugar during this stage). Immediately, remove the caramel from the heat and steadily whisk in the warm cream. The hot caramel will bubble up vigorously, so take care to add the cream slowly and carefully. Set the pot back on medium-low heat, and continue to whisk the mixture until smooth and thoroughly combined. Remove from heat and whisk in the butter. Pour the salted caramel into a wide clean bowl and allow it to cool until thickened, about 2-3 hours or overnight if preferred. The caramel can be prepared up to three days beforehand and kept stored in an airtight container, at room temperature, until ready to use. Preheat the oven to 350F (177C). Line a 9×13 baking pan with parchment paper or butter/spray the baking pan well. 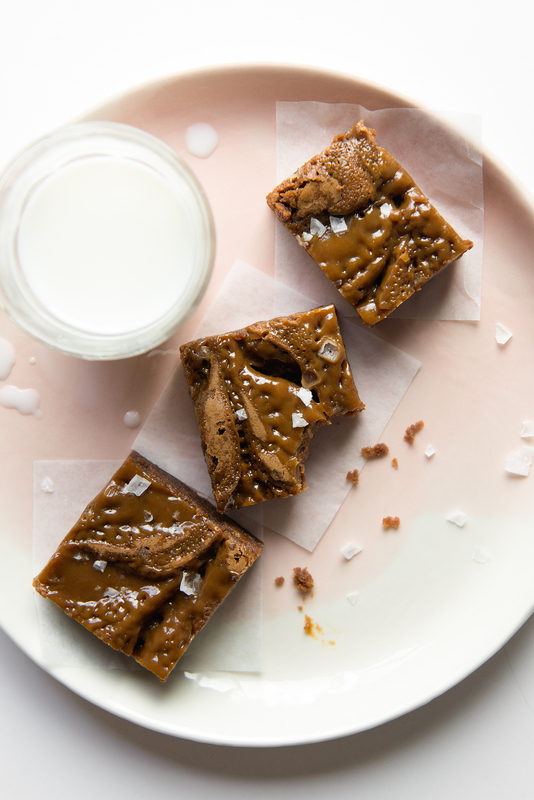 Using a spoon, drizzle on the salted caramel in wave-like motions across the surface of the brownie batter. If the caramel is too thick, reheat it slightly in order for it to flow more easily. Next, using a butter knife or skewer, drag the point of the knife through the batter in a similar wave-like motion horizontally and then vertically. This will produce a nice marbleized swirl effect. If using, sprinkle the sea salt all over the surface of the batter. I have never made caramel from scratch before, from watching great births baking show it seemed to have been hard for many of the contestants. But I gave this a try and it worked on my first go!!! The instructions are written perfectly and are easy to follow. The caramel on its own is on a whole other level, I could have just called it then and sat on the couch with the caramel and a spoon. But the end product of moist chocolaty brownies combined with the caramel and salt made for an amazing treat. Thank you for the great recipe, would highly recommend!! So happy to know that you enjoyed the recipe, Tasman! 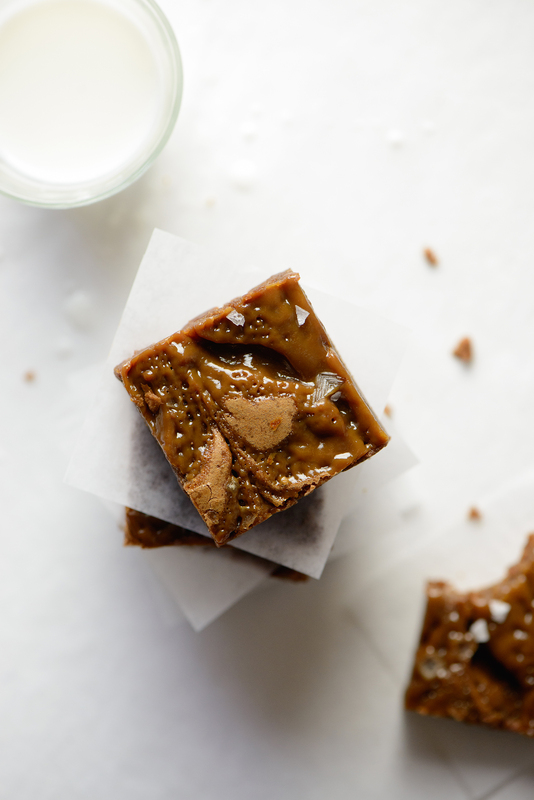 Way to conquer making caramel on the first go too!